The new fire rated partition provides a safe route to the stand for supporters with disabilities. It passes through an area dedicated for corporate hospitality and also separates the players’ lounge. “It looks like it has always been there” states Iain Tapsell Chelsea FC Project Manager. 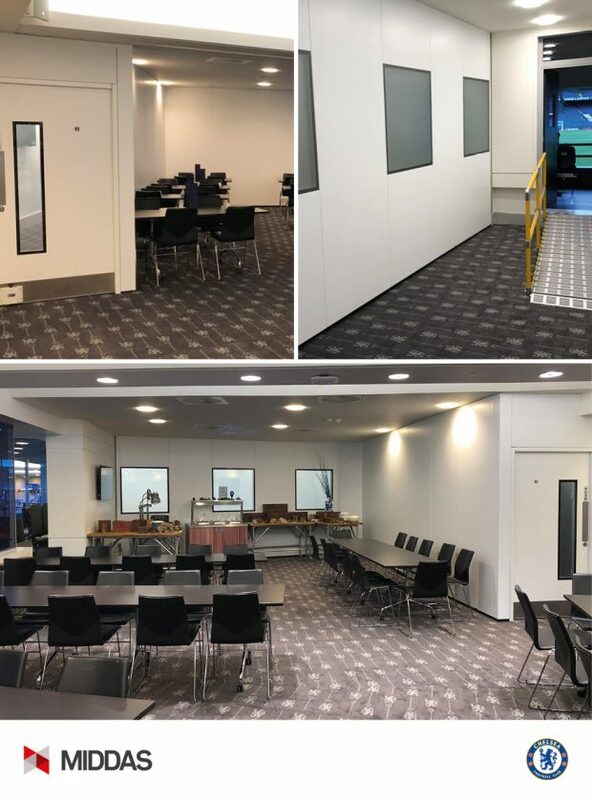 Chelsea FC pride themselves on the hospitality and events they offer at the stadium and need the ability to remove the fire rated wall when access to the stand is not required, creating a large open space for parties and major events. The complete project was manufactured off site ready to install. MIDDAS fitted captive location fixings to ensure the fire rated wall and door sets always go back in the same location helped by each individual components being numbered with quick assembly connections. Chelsea FC laid new flooring, with special infill pieces so there were no trip hazards when the wall was removed. Chelsea FC were very much aware of the need for a fully tested fire rated structure. MIDDAS provided the evidence required as the MIDDAS Walls, Doors and Vison panels have been independently fire tested as a completed system. Far too often individually fire rated components are installed together but never tested as a whole, unlike the MIDDAS offering. Iain Tapsell also complemented MIDDAS on the added benefit of the acoustic performance of the MIDDAS partitions which is very noticeable either side of the new partitions, an unexpected bonus of the MIDDAS system states Iain. See our Case Study or for more information on the extensive fire test data and acoustic performance of the MIDDAS demountable partition systems please contact Trevor Drummond.